Wilmington won the toss at batted on a lovely sunny day at Wilmington. After 6 overs they were scoring at around 5 runs an over and there were mutterings about how the pitch had improved. Charlie did mange to get Tim Briton out LBW (he wasn't happy), but the real drama started when Billy and Stuart came on to bowl. Wilmington wickets fell faster than the Indian's at the Oval due to a now spiteful pitch and some aggressive field placings by skipper Pete Smith. There were some good catches taken by Stringer (2 at silly mid on) , Martin and Charlie . Stuart ended up with amazing figures of 5 for 4 and Billy's were almost as good. Clive and Sam started circumspectly on a pitch which was sometimes popping up and sometimes keeping low. This wasn't a game that Sam could go and dominate right from the start, but although he was dropped 3 times, he played with excellent patience for another 50 , and with some obduacy at the other end, the 80 runs were eked out quite safely. 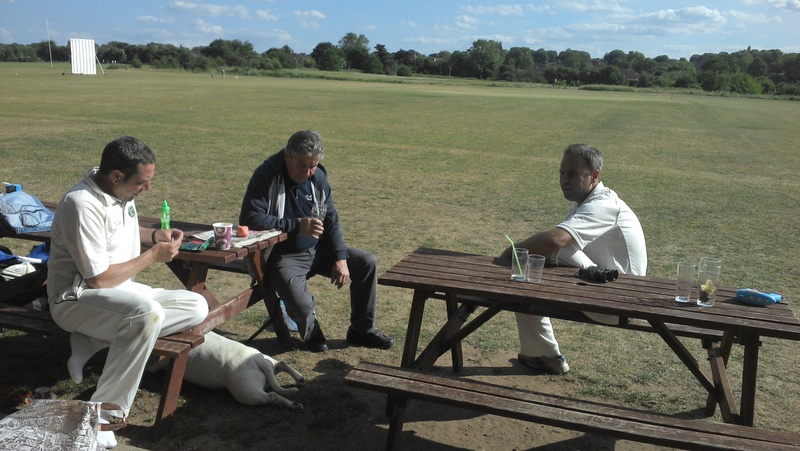 a Beer match followed, watched safely by your reporter from the comfort of a chair situated on the cover boundary, with only the occasional need to get up and chase the ball. Good runs were scored by Mark Richadson and Denman, but Billy still didn't get a bat !